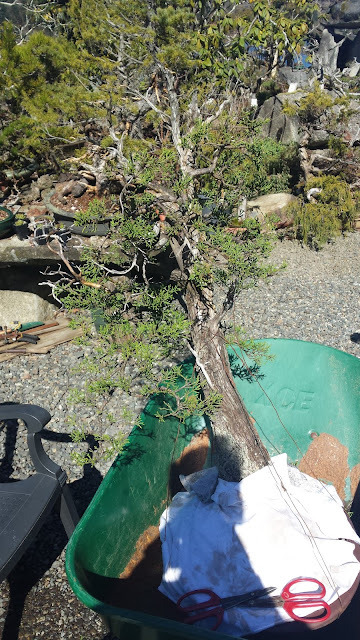 Searching online, I was only able to find a handful of other Monterey cypress specimen trained as bonsai - both of which appear dramatically younger than Dan's tree. Possible reasons for their rarity may be any combination of a lack of established knowledge on the species, the difficulty with tending to them (the previously mentioned backbudding issue) from those who have tried them, and/or a lack of mature stock to start with. 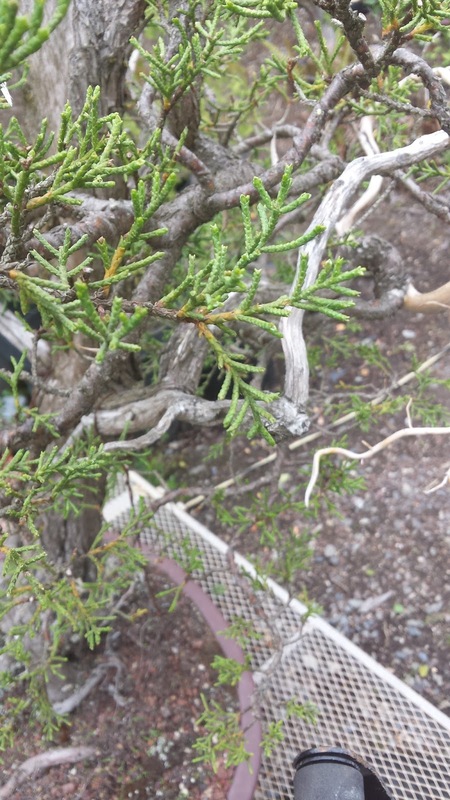 Monterey cypress trees do not seem to be found naturally stunted - the bonsai speciment I have found were either grown from seed or tamed from nursery materials. 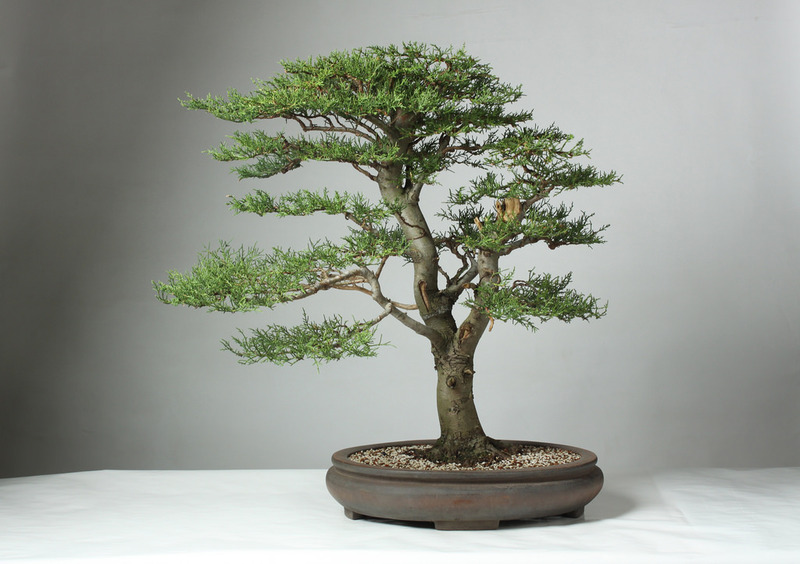 It may be well that there are not established bonsai examples of the species. This leaves us room to explore. 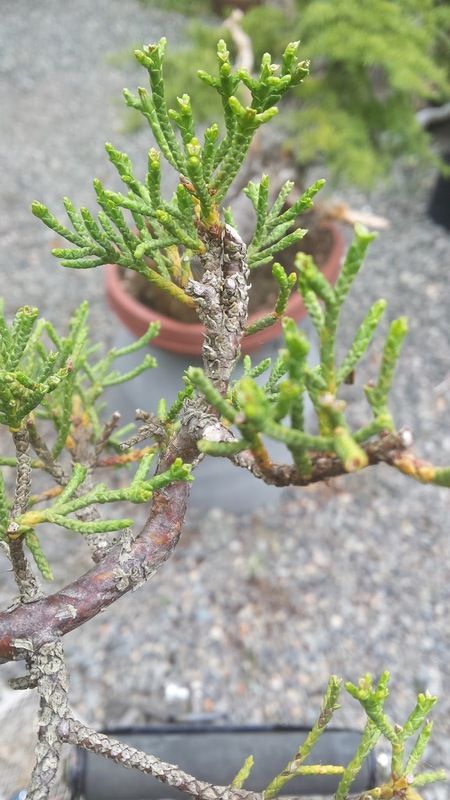 Instead what we will model off of - and what I think one should always keep in mind for bonsai - is how the species looks in nature. Here are several stunning, full-size examples. As I am not familiar with the Northern California area this species is from, I looked up coastal examples for reference. 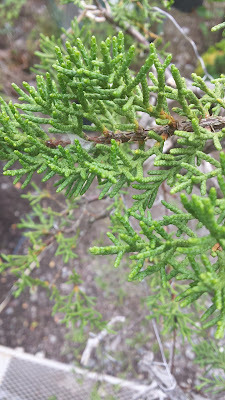 The flat-top style (famously introduced to the bonsai community to represent ancient Bald Cypress (Taxodium distichum) dominated my search results, however, Dan's choice of deadwood features reflected a different story and I wondered if his design reflected an uncharacteristic style for this species. 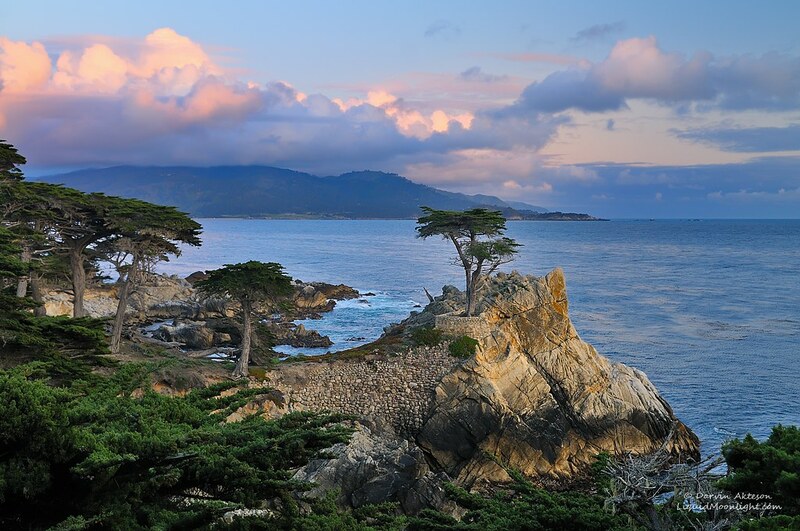 I later found two examples of Monterey cypress that were plentifully adorned with deadwood and reflected a storied, struggle for life - just the type of unusual trees Dan Robinson enjoys most. 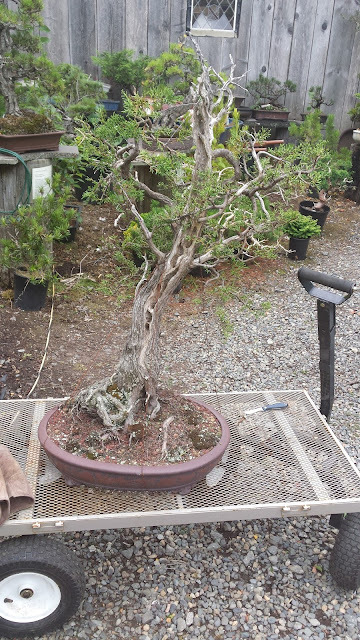 The wild, full-size example below I think captures the type of stunning, struggling tree Dan seeks to style best. 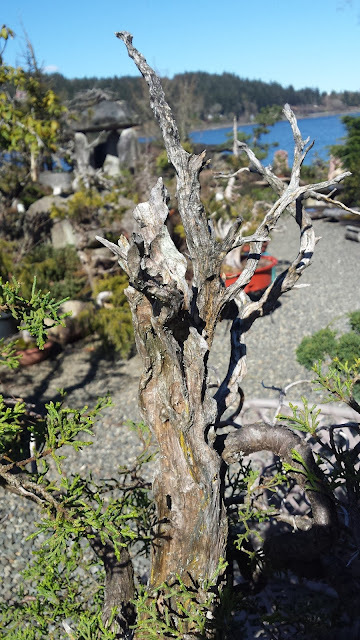 Dan is rarely satisfied with making a bonsai look like a juvenile tree, but he rather values trees that look truly ancient and which tell a compelling story about their life. tree, in contrast with the younger-looking examples. 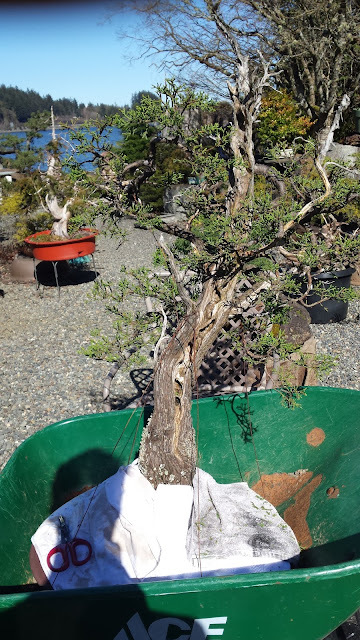 A side view of the tree. Now satisfied by my online search that Dan's gnarly Monterey design is feasible, I move on to the technical aspect of styling this species that I touched on initially - backbudding. The dilemma Dan has observed while caring for this tree over the past decade+ is that the tree's foliage progressively has pushed the outline further from the trunk. 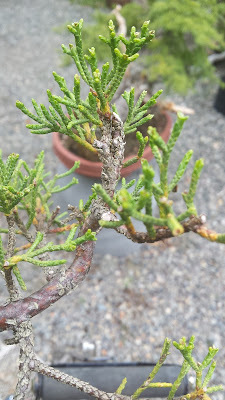 The concern with that progression is without some backbudding, the foliage outline could reach a point where it looks disproportionate and undesirable for the overall design. To attempt to combat this, late last summer Dan had me pinch the tips off of every single shoot on the tree to see what would result. It's too early to tell how successful this approach will be, but it has had some positive effects already observable. If any of you have attempted this species or would like to suggest solutions to attempt in future years, please let me know in the comments! The tree as of early August 2016. Pinched tips can be seen here - August 2016. Intact tips - August 2016.
zones that have become woody. The results we observed this spring from the last operation appeared along zones that already had foliage - there were more dense buds, some of which were barely visible. In that sense, we have succeeded at least in holding the foliage structure in place. 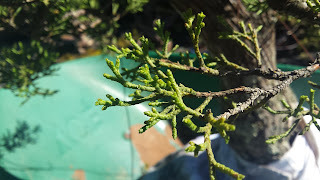 We repeated the tip-pinching method over the whole tree much earlier in the year this time (March), in hopes that the tree might have more time to respond the way we want - assuming it is possible for this species to do so at all. 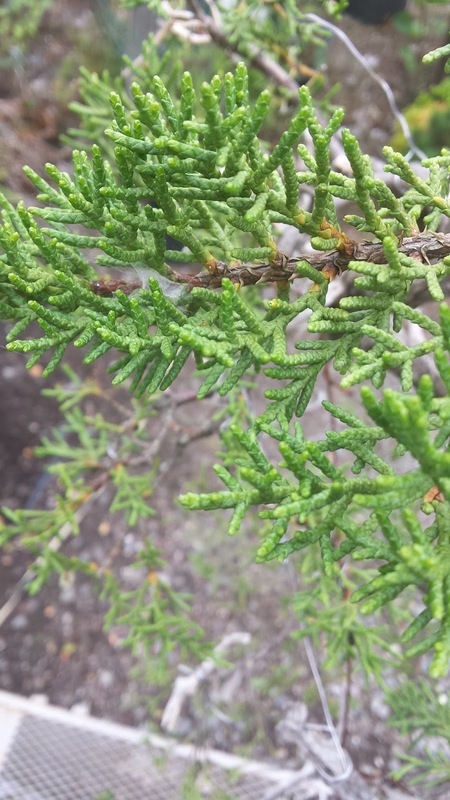 Below is what the foliage looked like in March 2017. 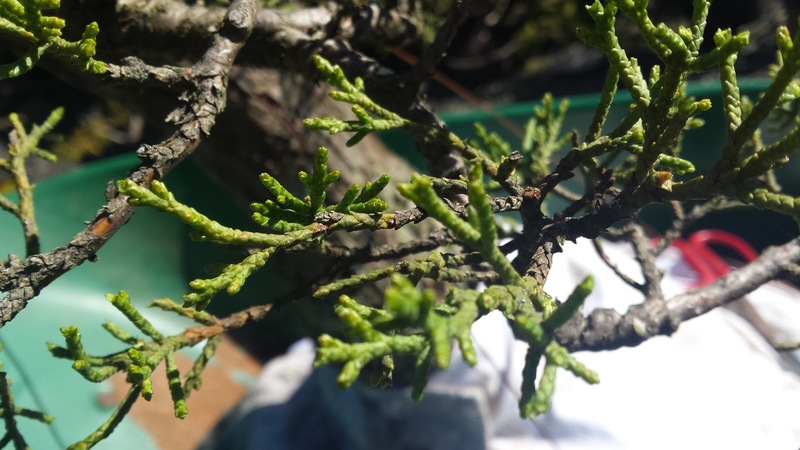 You may notice some small differences, but mostly the treatment will not manifest until the buds actuate later in the growing season. 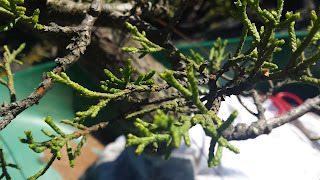 Lateral branches of the Monterey foliage do not appear to grow significantly this early, only the central branch of each "frond" (forgive my ignorance of the technical term for this species). Hopefully, with appropriate fertilizer, the tree may respond over the course of the exhibit and we can look at the results upon its return to the garden in October. Shoots are elongating - March 2017. Another shoot shot - March 2017. Unrelated to the new shoot subject, here's a branch Dan and I killed off last summer on this tree for a jin (a dead branch that remains on the tree). If you refer back to one of the full view pictures of the tree (both pictures are post-jin), before the jin, Dan viewed the back of the tree as "too happy" or too dense to fit his story of a struggling tree. I try to keep in mind the story the tree tells with every tree I prune and style so the art will look credible as a composition of all its features consistently point towards the same story. 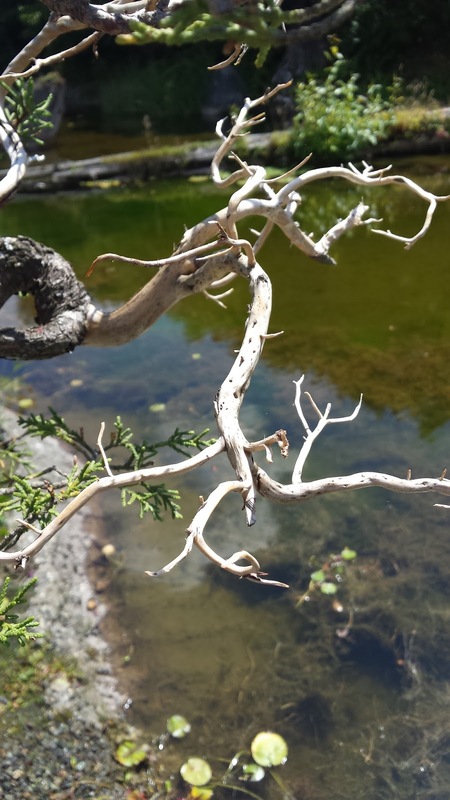 We did not apply lime sulfur (a bleaching agent) to the branch. In July, it was already starting to appear a more natural gray as opposed to the original cream-tan color. I absolutely love the collection of nature you have got there. I wish i could visit and experience the related stories but i live in a totally different geographical location.